The K&H ORB Series Retractable Cord Reel offers excellent performance at a competitive price in a compact size. The ORB Retractable Series Cord Reel is rated NEMA 4 for wet or dry locations and comes in 12/3 SEOW white cord and rated up to 20-Amps. March 24, 2011 - PRLog -- The K&H ORB Series Retractable Cord Reel offers excellent performance at a competitive price in a compact size. The ORB Retractable Series Cord Reel is rated NEMA 4 for wet or dry locations and comes in 12/3 SEOW white cord and rated up to 20-Amps. • NEMA 4 for wet or dry locations. • Accommodates 10' to 50' of cable. • Positive-lock ratchet or constant-tension payout. • Low-friction, four-roller cable guide. Outlet boxes, plugs, connectors, pivot or swivel bases. K&H Industries specializes in made-to-order retractable power cord reels for both commercial and industrial uses including indoor use, outdoor use (wet locations), data communication lines, grounding reels, and Class I Division 1 for Hazardous Locations. 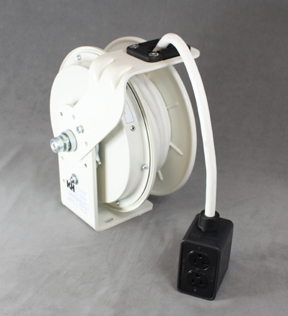 K&H’s Retractable Cord Reels are customized by cord length, amperage, cord type, gauge/conductor and pre-wired options such as outlet boxes, plugs, connectors, and work lights.